Last Week in Review: Job growth slowed. Wages ticked up. "You know I work all day to get you money to buy you things." The Beatles. Unemployment edged higher in December with more Americans entering the labor market. Wages ticked up, too. The Bureau of Labor Statistics reported U.S. employers added 156,000 new jobs in December, which was below the 175,000 expected. 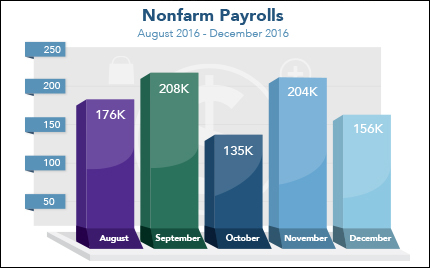 October and November job growth was revised higher by 19,000. In 2016, job growth totaled 2.2 million, down from a gain of 2.7 million in 2015. The Unemployment Rate ticked higher to 4.7 percent in December. While this might seem negative, it's actually positive because more Americans sought out employment in December. Average hourly earnings rose from -0.1 percent in November to 0.4 percent in December. In addition, average hourly earnings rose 2.9 percent year-over-year, the fastest pace since June 2009. Wage growth is a welcome sign for American workers, especially for those looking to buy a home. Home price gains remained solid in November. CoreLogic, a leading provider of consumer, financial and property information, reported that home prices, including distressed sales, rose 7.1 percent from November 2015 to November 2016. Low inventories of homes for sale continued to push prices higher. The recent rise in mortgage rates and the expectation of higher rates in 2017 could slow home price gains in 2017, CoreLogic reported. Home prices are expected to rise 4.7 percent from November 2016 to November 2017. Home loan rates were able to improve slightly after reaching two-year highs. They are still in historically low territory, though the volatility in the markets that followed the presidential election could continue. If you or someone you know has any questions about home loan rates or products, please don't hesitate to contact me. Mann Mortgage "Best in Class"
Cindy Grant a processor for the Mann Mortgage Billings Branch was recognized as a top processor for the company. It's quite an honor to receive this recognition considering the company has over 50 offices and can do loans in 15 states. On March 1, we began the company wide use of the Green Light Closing Checklist – a tool and guide for loan completion and quality prior to submission for doc orders. As our Closing Department works with our Processors to bridge gaps in and streamline processes, we would like to recognize our Processors with excellent quality, effort, production, and attitude towards innovation and doing it right. Each month the checklist data will be collected to determine the Gold, Silver, and Bronze Processors for the month. Updated websites with new links! More to be added in the future for reverse mortgage links!